*If you are currently on contract, a cancellation fee of $99 applies for non-NBN services. Available when you bundle with NBN on 18 months contract. Offer is not available for NBN pre-orders and existing TPG mobile services. Fill in your details and we will contact you with the most amazing NBN Bundle offer as soon as your home is NBN ready. Geoff on Google Reviews "Flawless execution and the speed is such a refreshing change from ADSL...top marks to TPG !! Thank you!" Neil on Google Reviews "Very happy with the prompt installation of the NBN service, everything went smoothly, I was kept informed of the progress and when completed I plugged the modem in and it just worked speed is great. I have been with TPG since 2004 and have always had great service." For families, we recommend the Fast Speed option. If you have multiple heavy Internet users in your home, then go for the Superfast Speed which is the fastest NBN speed available. (contract term x $(NBN Bundle monthly charge) + Setup + $20 Prepayment + $10 Equipment Delivery Fee). Additional once off $300 nbn™ New Development Charge applies if your premises is identified by nbn™ as being within the site boundary of a new development. Early termination fees apply. Typical Evening Download Speed is measured between 7pm and 11pm. The actual speeds for the service may be slower and vary due to many factors including type/source of content being downloaded, hardware and software configuration, the number of users and performance of interconnecting infrastructure not operated by TPG. Devices connected by Wi-Fi may experience slower speeds than those connected by Ethernet cable. For FTTB, FTTN and FTTC customers, we will inform you of your maximum line sync speed once available. If you are on a higher speed NBN plan, you have the option to downgrade to a lower speed plan without any penalties. For Fixed Wireless customers, your user experience could also vary due to congestion and fixed wireless network limitations. When the installer arrives at your property, ensure you check their ID before letting them inside, to ensure they are a contracted NBN technician. The next step is for your installer to complete the copper cabling and check that your premises is properly connected to the NBN. 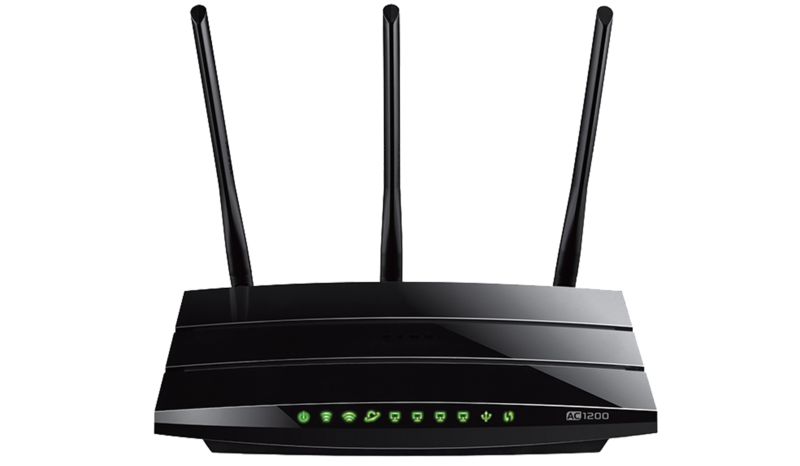 TPG will provide you with a 4 port Wi-Fi Modem Router with VoIP capabilities that will let you connect to the internet and make/receive phone calls using your TPG Voice Service. Click here for more details. The technicians are not required to install any further equipment. You can track the progress of your installation by clicking here. When the installer arrives at your property, ensure you check their ID before letting them inside, to ensure they are a contracted NBN installer. The next step is for your installer to complete the copper cabling and check that your premises is properly connected to the NBN. 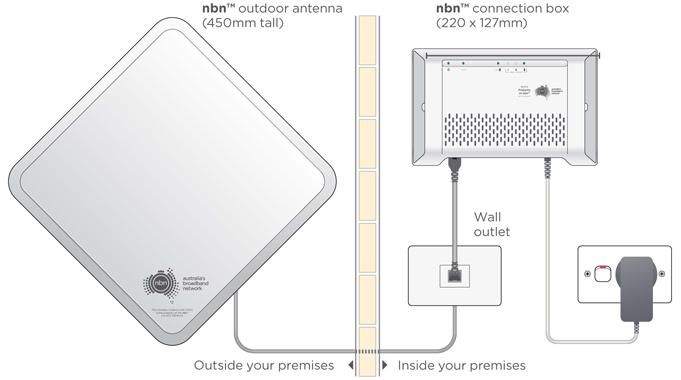 Your NBN installer will physically connect the FTTC connection to the NBN network and install the NBN Connection Device (NCD) in your premises. You will need to think about where you want the NBN equipment to be installed, as on the day of installation you will need to point out to the installer the location where you want these NBN equipment to be installed. The installer will confirm whether the requested work can be performed without additional charges. Most suitable places are: near an accessible power point, in a cool, dry, ventilated area and away from busy areas where it may be knocked and damaged. 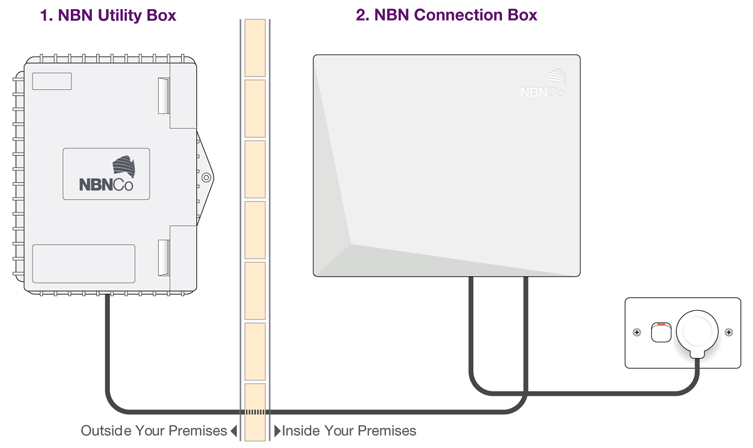 You need to be aware of fact that the NBN connection box will be installed somewhere 'inside' your premises which may not be in your desired area. This placement may impact how you get connected to NBN service. Cable that connects the outdoor antenna into your property, the wall outlet and the connection box. NBN has a strict "leave it as it's found" policy so there is no need to be concerned about any permanent damage to your property. A standard installation normally takes between approximately 2 and 4 hours. If you request the NBN technician to perform a non-standard installation, the time required may be longer. Your installation may include some or all of the equipment below. NBN Co installer can confirm what equipment has been installed at your property. A splitter if you have a pay TV service or existing cable internet that is connected to the same wall outlet as your NBN connection box. A new wall outlet may be installed. The technicians are not required to install any further equipment. However, you can ask the technician on the day if they can customise the installation of your NBN equipment (additional charges apply). If your building doesn't already have a fibre-optic cable connected, running the cable into your premises may require the digging of a small trench, or, if it's coming from overhead, some minor clearing of vegetation. NBN Co has a strict "leave it as it's found" policy so there is no need to be concerned about any permanent damage to your property. If your premises already have fibre-optic cable connected to a Premises Connection Device (PCD), standard installations normally take between approximately 2 and 4 hours. If your premises do not have the fibre optic cable connected then a standard installation could take between 4 and 8 hours. If you request the NBN Co technician to perform a non-standard installation, the time required may be longer. 2Speed will be shaped to 32Kbps/32Kbps for the billing cycle in which the monthly usage quota has been exceeded. Downloads and uploads are counted. TPG Voice Service on NBN FTTN, FTTB, FTTC, Cable (HFC) and Fixed Wireless is a Digital Voice Service which is delivered using Voice over Internet Protocol (VoIP) technology. Digital Voice Service requires a broadband connection and power to the Wi-Fi modem router supplied by TPG. If there is a broadband connection outage in your premises due to power or other faults, the Digital Voice Service will not work and you cannot make phone calls including "000" emergency calls. The NBN S Bundle allows you to make unlimited Local Calls (excluding 13/1300 numbers) and unlimited Standard National Calls to Landlines. Calls to 19/1900 numbers are not supported. Charges for calls made that are not included in the bundle (e.g. AU Mobile numbers, calls to 13/1300 and Directory Services) will be charged at Listed TPG rates by deducting usage charges from your Prepayment. The service is for residential consumers only and may not be used for commercial purposes. Charges for calls are not included in the NBN S Bundle plan and will be charged at Listed TPG rates on a 'pay as you go' basis and deducted from your Prepayment. Calls to 19/1900 numbers are not supported. The NBN M Bundle allows you to make unlimited Local Calls and unlimited Standard National Calls to Landlines, excluding 13/1300 Calls. Calls to 19/1900 numbers are not supported. Charges for calls made that are not included in the bundle (e.g. calls to 13/1300, AU Mobile numbers and Directory Services) will be charged at Listed TPG rates by deducting usage charges from your Prepayment. The service is for residential consumers only and may not be used for commercial purposes. The NBN M Bundle allows you to make unlimited Local Calls and unlimited Standard National Calls to Landlines, excluding 13/1300 Calls. Calls to 19/1900 numbers are not supported. Charges for calls made that are not included in the bundle (e.g. calls to 13/1300, AU Mobile numbers and Directory Services) will be charged at Listed TPG rates by deducting usage charges from your Prepayment. Charges for calls are not included in the NBN SL Bundle plan and will be charged at Listed TPG rates on a 'pay as you go' basis and deducted from your Prepayment. Calls to 19/1900 numbers are not supported. The NBN Extra Bundle allows you to make unlimited Local Calls (includes 13/1300 numbers) and unlimited Standard National Calls to Landlines. Calls to 19/1900 numbers are not supported. Charges for calls made that are not included in the bundle (e.g. AU Mobile numbers and Directory Services) will be charged at Listed TPG rates by deducting usage charges from your Prepayment. The service is for residential consumers only and may not be used for commercial purposes. The NBN L Bundle and XL Bundle allow you to make unlimited Local Calls and unlimited Standard National Calls to Landlines, excluding 13/1300 Calls. Calls to 19/1900 numbers are not supported. Charges for calls made that are not included in the bundle (e.g. calls to 13/1300, AU Mobile numbers and Directory Services) will be charged at Listed TPG rates by deducting usage charges from your Prepayment. The service is for residential consumers only and may not be used for commercial purposes. The 100 International Minutes per month included in the NBN Extra Bundle, L Bundle and XL Bundle can be used to call International Landline and Mobile destinations (excluding calls to satellite phones) listed on our International Call Rates page. Standard per minute rates listed on our International Call Rates page apply after the first 100 minutes of International Calls and for calls to satellite phones. Unused included minutes for international calls expire at the end of each month. The NBN XXL Bundle allows you to make unlimited calls to Landline and Mobile numbers in 11 countries (Canada, China, France, Germany, Greece, Hong Kong, Malaysia, Singapore, Taiwan, United Kingdom, United States), unlimited Local Calls, unlimited Standard National Calls to Landlines (excluding 13/1300 Calls) and unlimited calls to Standard Australian Mobiles. Calls to 19/1900 numbers are not supported. The bundle also includes 500 Call Minutes to India per month. Unused included minutes for calls to India expire at the end of each month. Standard per minute rates listed on our International Call Rates page apply for International Calls to other countries, calls to India after the first 500 minutes of International Calls, and calls to satellite phones. Charges for calls made that are not included in the bundle (e.g. 13/1300 numbers and Directory Services) will be charged at Listed TPG rates by deducting usage charges from your Prepayment. The service is for residential consumers only and may not be used for commercial purposes. The National Broadband Network (NBN) is a national communications infrastructure currently being built by nbn™ on behalf of the Federal Government. You can sign up to TPG NBN service when it is available in your area. To check for availability, please enter your address here. The rollout of the NBN network uses a mix of access technologies to deliver a fast and reliable internet service, wherever you live in Australia. The type of access technology that will connect your home or business to the NBN network will depend on your location. Fibre to the Curb (FTTC): FTTC is a way of delivering access to fast broadband by running fibre-optic cable to an outdoor pit near the end user’s premises and from there using the existing copper network to the end-user premises. Fixed Wireless: NBN Fixed Wireless services are delivered by radio communications from an nbn™ Fixed Wireless facility directly to a small outdoor antenna attached to your premises. The nbn™ Fixed Wireless network uses advanced technology commonly referred to as LTE or 4G, and is engineered to deliver services to a fixed number of premises within each coverage area. This means that the bandwidth per household is designed to be more consistent than mobile wireless, even in peak times of use. Unlike a mobile wireless service where speeds can be affected by the number of people moving into and out of the area, the speed available in a Fixed Wireless network is designed to remain relatively steady. # Typical Evening Download Speed is measured between 7pm and 11pm. The actual speeds for the service may be slower and vary due to many factors including type/source of content being downloaded, hardware and software configuration, the number of users and performance of interconnecting infrastructure not operated by TPG. Devices connected by Wi-Fi may experience slower speeds than those connected by Ethernet cable. For FTTB, FTTN and FTTC customers, we will inform you of your maximum line sync speed once available. If you are on a higher speed NBN plan, you have the option to downgrade to a lower speed plan without any penalties. For Fixed Wireless customers, your user experience could also vary due to congestion and fixed wireless network limitations. If you are an existing TPG ADSL2+ customer and interested in the NBN service, please click here or call our Customer Service on 1300 920 158. 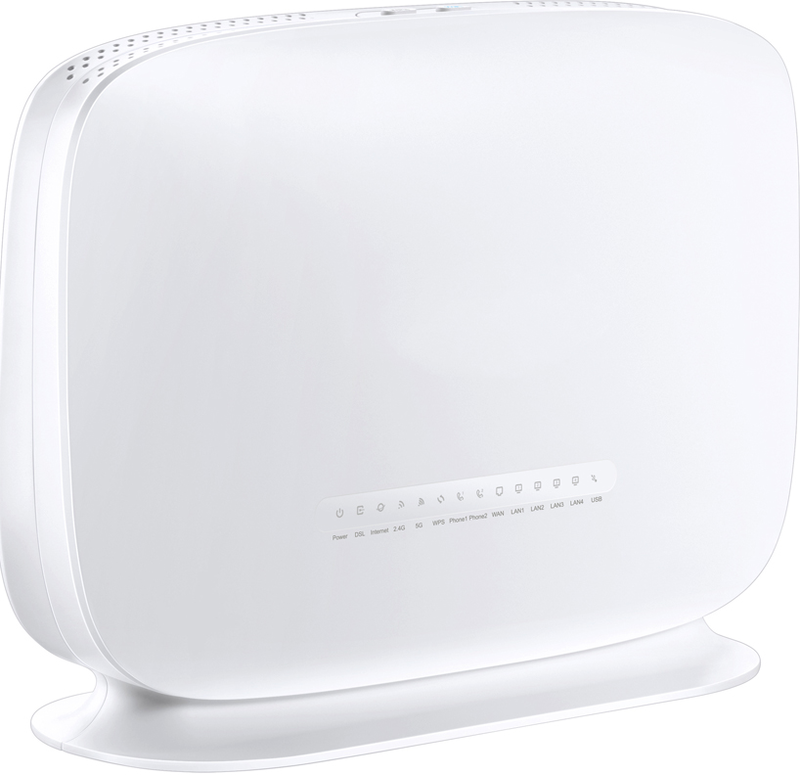 Yes, TPG NBN bundle includes an NBN ready 4 ports Wi-Fi modem, a $10 delivery fee applies. Installation of NBN service can take between 2 to 30 working days depending on the demand of NBN services in your area and the availability of the nbn™ technician to perform the installation. Yes. You will be sent an email notification confirming the installation date and timeframe. We will also notify you if a technician appointment is required to install your NBN service. You, or an authorised person over 18 years of age will be required to be at the premises on the day of the technician visit. TPG NBN service on FTTN, FTTB, FTTC, HFC and Fixed Wireless technologies will NOT work in the event of a power outage. The Voice Service requires a broadband connection and power to the Wi-Fi modem supplied by TPG. If there is a broadband connection outage in your premises due to power or other faults, the Digital Voice Service will not work and you cannot make phone calls including "000" emergency calls. FTTB: Your side of the Main Distribution Frame (MDF). This is a small telecommunications room in a common area within your block. This applies mainly for apartments, office blocks or larger business premises. Can I use my existing phone wall socket for TPG Voice service? Yes, as soon as TPG NBN service has been installed, you will be able to make outgoing calls from your TPG Voice Service. TPG will charge you for any call usage. However, inbound calling to your number will not commence on TPG Voice Service until porting is completed which will take an additional 1 to 5 business days after your TPG NBN Service is installed. With TPG Voice Service, you can monitor your actual usage (in near real time), bar outbound calls of various types, and make use of other spend management tools via My Account at www.tpg.com.au/account. For more information about using these tools, please contact Customer Service on 13 14 23. Once TPG NBN Voice Service is installed, are there any services that will not work on my TPG Voice Service? Can I watch Foxtel if I have TPG NBN bundle service? Does Foxtel On Demand or program purchase work with TPG NBN? If you have the latest Foxtel set top box, you can purchase and download programs using the Ethernet or Wi-Fi connection (set top box dependant) in the set top box to connect via TPG NBN Broadband. If you have the older Foxtel set top box without an Ethernet or Wi-Fi connection, program purchase through your landline will not work with TPG Voice service. We suggest you contact Foxtel about upgrading your set top box. 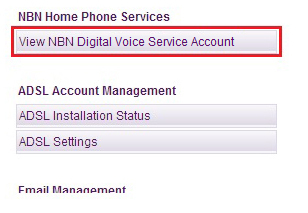 Once I register for NBN Bundle, can I cancel the NBN service or Voice service component? No, the NBN or Voice service cannot be cancelled separately. Since TPG NBN is a bundle plan, cancellation will cease both services. Once your TPG NBN bundle service has been activated, if you currently have any existing services such as phone or internet at your premises, you will need to contact your current provider to have these services cancelled to ensure you do not receive any further bills. TPG recommends you check with your current phone and/or internet service provider regarding contractual commitments and termination/disconnection fees associated with your current services. TPG is not responsible for these charges. If you are also porting your existing phone number to TPG, do not cancel your phone service until the number has been ported. How am I charged for TPG NBN Bundle? Can I receive Reverse Charge Calls/Collect Calls using TPG Voice service? Can I view my TPG Voice Service call usage online? New Development Charge is a one-time charge of $300 to all new orders for services in new development locations. This charge is a contribution in a new development to the infrastructure cost of the nbn™ network. TPG Voice offers a range of free standard features e.g. call barring, call waiting, call forwarding. However there may be some specific services on your existing line that are incompatible with TPG Voice. How do I list my TPG Voice Service number in the directory? Please follow the instructions below to register your existing TPG Voice Service number in the Directory Listing. We can provide TPG NBN Bundle to your new location if TPG NBN is already available in that area. We may be able to offer other products that are available in your new location. Standard NBN Bundle relocation fee applies. You can only change plan (upgrade/downgrade) with TPG NBN service. TPG NBN Bundle customers are not able to change their plan to a TPG ADSL2+/ADSL services. Please refer to our NBN Additional Pricing.